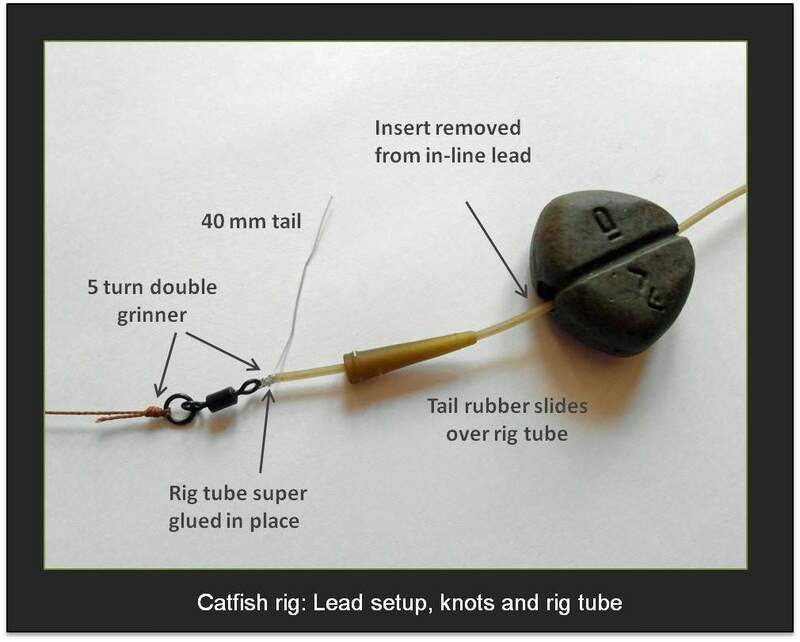 Here’s a simple and very strong bottom bait rig setup for catfish fishing in lakes: easy to tie and highly effective! 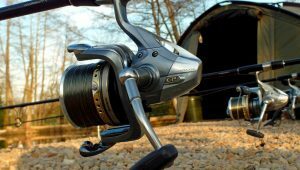 Whether you’re fishing for catfish in a lake in the UK or abroad, this rig is suitable for catfish from 10lbs to 100lbs. I like to keep all my fishing simple. 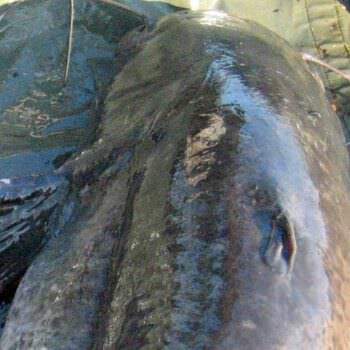 It’s so easy to tie yourself in more knots than necessary when targeting catfish. Of course there are a lot of complicated carp rigs that you can tie too but I’ve long since abandoned that endless chase for a better rig. I use what I use because it works and who could ask for more than that? And this rig has enabled one angler in July 2014 to land the new Beausoleil lake record and first 100lb catfish from the lake. Whether you’re targeting catfish in lakes for the first time or not I still believe that it’s hard to beat a really simple strong rig with a razor sharp hook. I’ve seen a number of catfish anglers try all sorts of fancy rig wizardry at Beausoleil, usually to no avail. 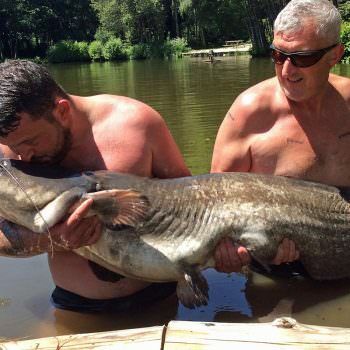 Let’s face it, catfish are not difficult to catch. Difficult to land, yes, but not difficult to catch: see my post on How to catch catfish in lakes. 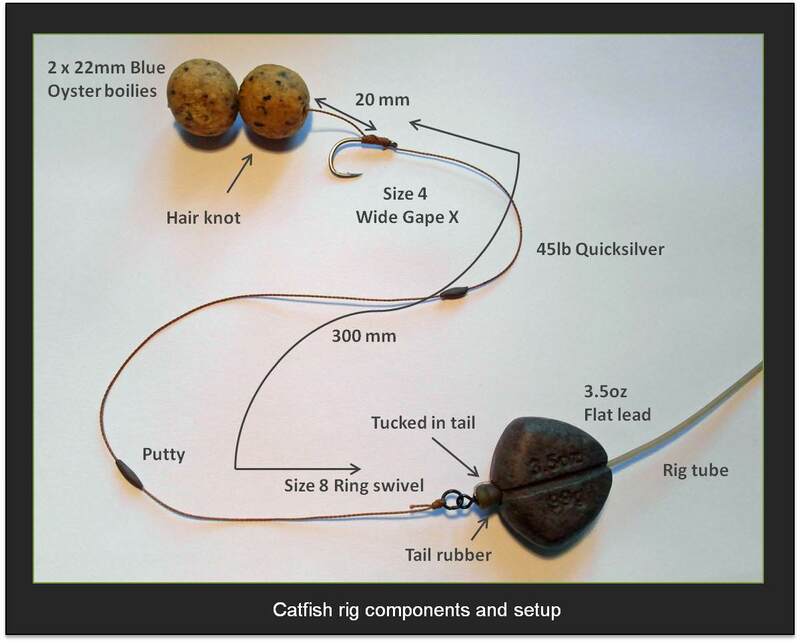 So let’s have a look at this catfish rig in more detail. This may look like the most basic rig in the world. However if you take a closer look there are some details which make it special and very effective. In this example I used my homemade baits. 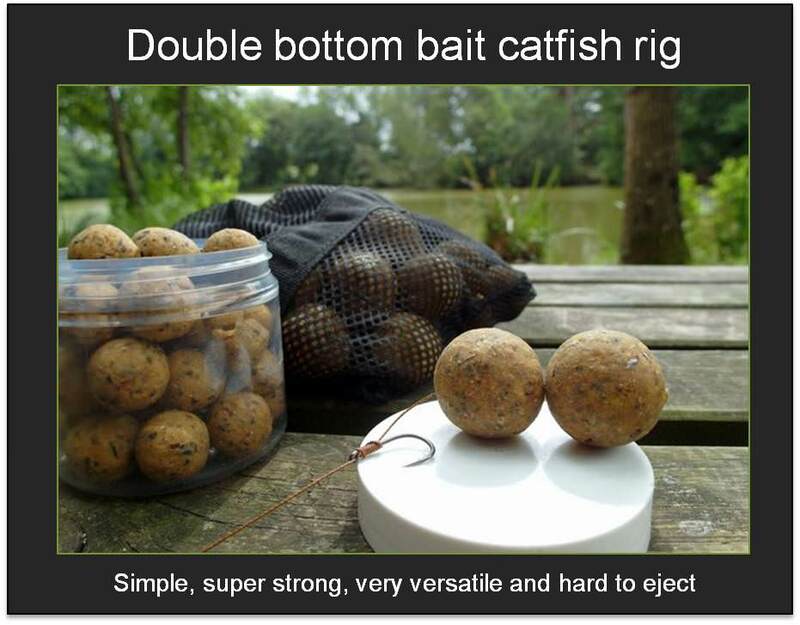 ► Much as specialist catfish anglers might object to the concept of using boilies to catch catfish, the fact of the matter is that boilies are highly effective for catfish. 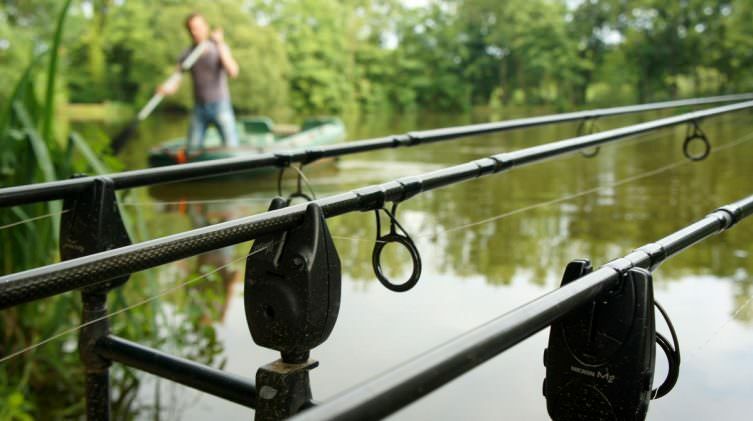 ► If you are at a venue with both carp and catfish, the secret of catching catfish with this rig rather than carp is the way you use it! When the catfish are active all you need to do is to bait heavily with boilies and pellets and you’ll catch catfish and not carp and the carp will not come anywhere near feeding catfish! ► The other point to note here is the length of the hair loop. 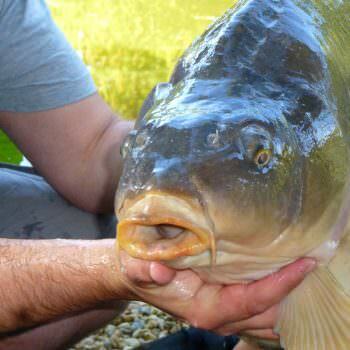 If you’re using a standard hair stop then the length should be 1.5 times the diameter of the baits. This way, the hair knot is in the middle of the top bait as shown and locks them together. This is the most important part of the rig. Sharpness is everything as catfish have very tough mouths so I still hand sharpen every hook when cat fishing. My hook link of choice is Kryston’s 45lb Quicksilver (it’s actually designed as a snag leader but makes a very tough hook link). 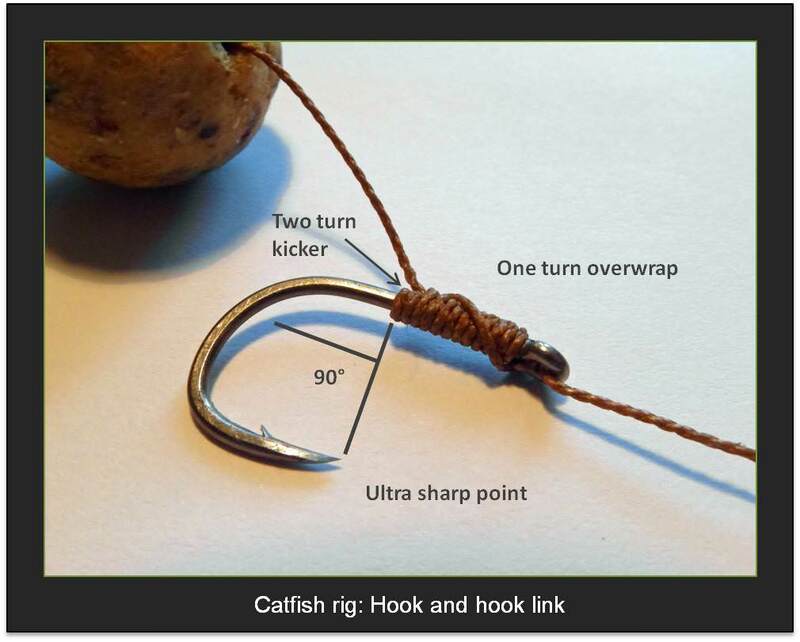 This is connected to the hook with a standard knotless knot but I add a couple of extra turns beneath the hair as a kicker and then another turn to over wrap the knot to help prevent it from slipping. As you can see I whipped down the shank 10 times. This means that the hair exits the back of the hook perpendicular (90 °) to the point. It’s very important to tie very good knots when cat fishing. Time and time again I see anglers using blood knots to connect the mainline to the swivel. This knot is not up to the job (pardon the pun!). There are only two knot options for the mainline: the Palomar knot or the 5-Turn grinner. The Palomar is very easy to tie. In this example I used the 5-Turn grinner. 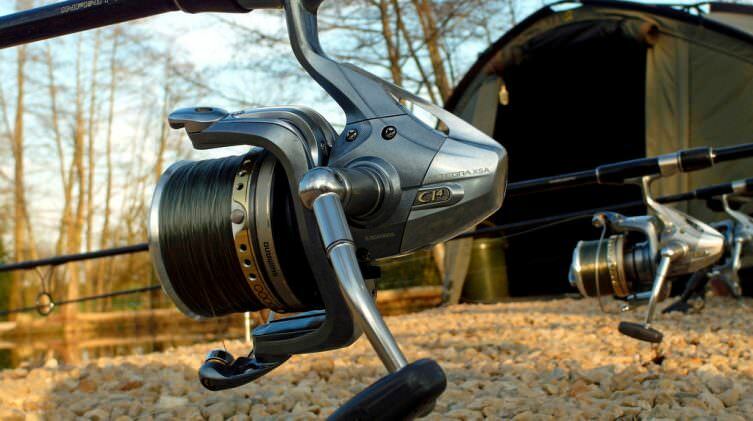 I always use a 5-Turn grinner for the hook link. Here’s a little trick. I call it “the Tell Tale tail”! In order to optimise hooking and bite indication, I always use my Beausoleil carp rig lead setup. To do this, push the tail rubber over the swivel to the distance shown in Figure 1. 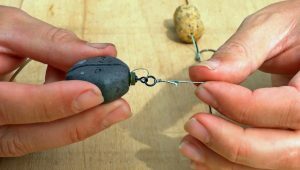 Then slide the lead over just hard enough for it to stay in place when you lift the rig by the baits. 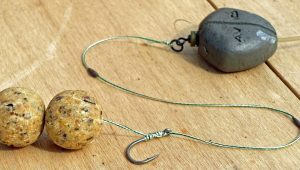 A quick shake of the baits should see the lead drop off and turn into a running rig. This will confuse the catfish and it will move off with the rig. No matter which way it swims you will get a run! In order to protect the mainline from premature failure, it’s a great idea to use 2 – 3ft of rig tube. It’s very important that the rig tube does not slide away from the swivel knot during the fight. 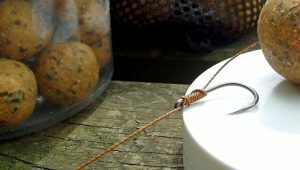 A simple way of ensuring this is to dab a blob of super glue on the mainline just above the knot before sliding the rig tube down to meet the knot. Within a few minutes the rig tube will be immoveable and prevent the catfish pectoral fins from slicing through your mainline. To dismantle, simple cut through the bottom 5 mm of rig tube and mainline. This simple catfish rig has accounted for countless captures at Beausoleil and is up to the task of tackling the real monsters. My only word of caution is this: before you use it, spend some time down the gym, you’ll need to be in good shape for the battles that are to come!